San Luis Obispo County Sheriff’s spokesman Tony Cipolla announced yesterday that the department is conducting a thorough investigation into allegations of animal cruelty by an area sheep rancher. However, he also stated in the press release that Jean (JB) Jaureguy’s explanation that his sheep died not from animal neglect but from a mild winter storm was accurate. Cipolla noted that because the sheep were sheared several days before the storm, they died as a result of being exposed to the elements. On Friday, a hiker walking trails at Heritage Ranch discovered dozens of abnormally thin and weak sheep. In addition, there were dead sheep in ravines, in a creek and on hillsides. The hiker called the sheriff and reported possible animal cruelty. Sheriff Commander Jim Taylor said that because of the drought, the condition of the animals was not unusual. He also noted that the thinness of the sheep may be normal for this type of animal. “It’s possible for a person not familiar with livestock to view them and feel that they are in a weakened condition when in fact they might not be,” Commander Taylor told KSBY. Nevertheless, several ranchers who raise sheep said the Jaureguy’s animals look malnourished and that they know no one who shears their sheep this time of year. Cipolla said the findings of the investigation will be turned over to the District Attorney’s Office for consideration of any possible criminal neglect charges. Concerning how farm animals might behave during an extended storm – any body who has ever cared for farm animals know that the only animal dumber than a sheep is a chicken. It would be difficult to say if a sheep is dumber than some of the uninformed people here that have made jumps in conclusions or attribute human qualities to sheep. The intelligence of sheep is irrelevant. As for the cause of the condition of these animals, that remains in question. Some argue disease… If that were truly the case, aren’t there regulations in place requiring one to separate sick animals so they don’t contaminate others? Wouldn’t Mr. J have noticed their condition when he stripped them of their wool two days before a storm hit- one he claims took their lives? If they were diseased as some speculate, where have the dead bodies gone? Are they properly being tested? In my mind, after watching the second video, there is no doubt Mr J directly violated penal codes on animal welfare. I don’t care if you know this man and think he is the nicest man around. The fact is, he showed ZERO compassion for dying animals as he threw them heaping piles amongst the dead. That IS a crime as written in California law. Those of you who would like to stop anymore animals from being treated in this manner, please sign this petition. Nobody has mentioned what happened to the sheep…..
Mr. Jaureguy’s reputation has been tarnished by some anonymous hikers. Who are they?What are their names? The hikers are not anonymous. Please see the videos they took before worrying about Mr. Jaureguy’s reputation. 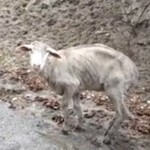 Read more here: http://www.sanluisobispo.com/2014/03/03/2953500/paso-robles-sheep-animal-neglect.html#storylink=cpy or see the story and videos in the Paso Robles Daily News. Read the initial article, they are not anonymous. Whoever wrote this article merely failed to name them. Their names are stated in the original article on CCN. That said I don’t think dragging their names in the mud will help either. From reading I don’t think they have ill intentions here. Maybe just misinformed and concerned but not bad intentions. Like I have said before, let’s put all the lynch mobs on hold on both sides and let the investigations play out. Well, at least we know why we pay Tony Cipolla for a made-up job. This is not new news to those of us who have been here our whole lives. Stephenson started buying up land around San Juan Road years ago, many times paying above market value. His goal of reconstituting the San Juan Rancho is conveniant as it masks the operations of Santa Cruz Biotics. Many of those who want to crucify the sheep rancher are exemplifying our miopic tendency to focus on little things while much greater offenses are perpetrated in our midst. Of course nobody stumbled through the 40,000 acre San Juan with a cell phone camera and filmed those horrors to post on the internet. Take a ride out San Juan Rd and Bitterwater Valley Rd sometime and see what is really going on in our county. So what is going on? I don’t understand. Nevermind, I read the New Yorker story. Cal Coast News — take note. A national story on animal abuse in our county.